A UFO wave is ufology jargon for a significant and temporary rise in the number of UFO reports. Waves enerally last longer than a few weeks and less than a year, during which time the number of UFO sightings increases substantially over a wide area, often nationally or internationally. Waves are different from UFO flaps in that UFO flaps are usually considered to be more localized and of a shorter duration. However both terms are sometimes used synonymously and there are no fixed numbers that clearly separate the two terms. 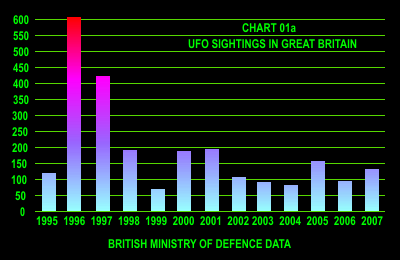 Chart 01a ( top left ) illustrates the 1996 UFO wave in Great Britain where sightings soared from 117 in 1995 to over 600 during 1996. Skeptics point out that the sudden rise is probably due to the influence of the paranormal pop-culture of the 1990s, citing television programming like The X-Files and Sightings. Ufologists tend to agree, but also point out that it doesn't mean the reports are not genuine. The popularity of the programming may have simply eased the worries of those who would otherwise have been reluctant to report their sightings for fear of ridicule.